Hunting has taken a new dimension these days. Modern shooters are steps above those a century or even several decades ago. Bows and arrows have always been part of hunting and primitive shooters depended exclusively on them to hit their targets that were a distance away. It’s no longer so with the rifle. Up till today, the rifle is the most sophisticated hunting tool. However, it’s the early shooters with the gun who must target and shoot with the rifle on their hand always. The modern shooters need the comfort of being able to rest their rifle on a stand while shooting. Technology did not leave the hunter in the dark ages. Carrying them along, there is the invention of the rifle bipod. A hunter with his rifle and his full set of ammunition should not feel completely equipped for every hunting job if he doesn’t have a bipod for their rifle. A few, if there’s any shooter who understands his job will go hunting without carrying a long bipod because it’s an indispensable tool for accurate shooting. Fortunately for them, a lot of rifle bipods are there in the market and the manufacturers are upping their productions. Here we review for you top best hunting rifle bipods for the money in 2017 and 2018 according to sizes. There’s no contending the popularity of this bipod for tactical operation and hunting. 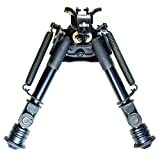 Few shooters start up their shooting skills without UTG Tactical OP Bipod. This is because it is the best rifle bipod among the most affordable ones in the market. This affordability complements the other interesting features like the full adjustability of the legs which comes with the appropriate spring to ensure a strong tension that stabilizes the riffle. So you’ll be able to adjust the bipod’s legs comfortably until you get the right targeting position where you can shoot more precisely. Additionally, it has the Picatinny rail as well as swivel stud mounting. This makes this bipod more versatile, being usable with any firearm without the need for any other adapter. 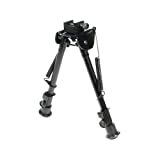 By this it is the best bipod for the money, helping you to further spend less. Even then, you’ll still enjoy the durability of the bipod because it’ll stand the test of time. It’s made from aluminum while its platform is of steel; both heavy-duty materials. The weight of this bipod is another nice feature. It’s lightweight bipod, weighing just 13.3 ounces. You don’t travel hunting carrying too much load with you. UTG Tactical Op Bipod has a feature that’s usually missing in many bipods. This is the panning allowance that allows you to have a very sharp focus while still moving your rifle to the west or east. This rifle bipod made by Peloton Technology is the best bipod for hunting rifle among the 6-9 inch rifle bipods. It’s a lightweight and a heavy-duty bipod at the same time. The manufacturers of this rifle bipod used the aircraft-grade alloy. This gives it the extra strength that enables it to carry weapons of all weights with a stunning stability of shooting position. It derives its longevity and durability from its source material. Some users say it’s the best bipod for long range shooting because of its long, strong, and steady telescopic legs. You’ll be able to shift positions from anywhere between 6 and 9 inches while exploring the best shooting position in an uneven terrain. 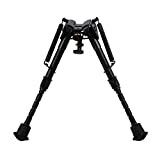 Talking about the legs of this bipod; you have a lot of other attractive features. They’re foldable, making it possible to stow them near your rifle when not in use for storage. The legs can also fully retract as soon as they’re released, thanks to the robust springs in the legs. If you need to attach a sling to the bipod, you’ve got no problems. It has a standard stud sling hole for that purpose. The rifle bipod will surely give your rifle a firm grip. Harris Engineering is reputable for manufacturing the highest quality rifle bipod for the use of shooters. Their 1 A2-BRM Solid Base Bipod is a great long range accuracy bipod for sale in 2017. It has the arms that can be extended as long as between 6-9 inches. It is actually the best bipod for the height of 6-9 inches. It has many other interesting features that earn it a place in these rifle bipod reviews here. One of those is the adjustable legs with notches of 1-inch increments. This makes it fast and easy to adjust it between heights. It’s strong to bear the weight of all lightweight and heavy-duty firearms because of the materials. It’s made of highest grade aluminum alloy and hardest steel. This means that while your firearm is perfectly resting on this bipod, you can comfortably be perfecting your aiming adjustment. You’ll love its friction lock that is made from the large knurled knob. It will help you to stabilize it after you’ve extended it for as long as you desire for the particular operation. All this makes it easy to operate. The weight also makes it worthy of your money. It’s just 13oz. 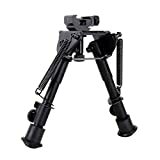 Going by its impeccability and its impressive designs, it won’t take long to convince the most skeptical shooter that the Ohuhu Sniper Rifle Bipod is the best sniper rifle bipod. The hunters who want to achieve successive and accurate shots rely on this bipod to get a balance standing because it fits the need of those of them that find it hard to properly place their rifles due to unevenness of the terrain. This sniper bipod is made from the heavy-duty materials guaranteeing its strength and reliability. It has other fascinating features. 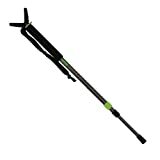 This includes the adjustable leg design that can be adjusted from anywhere between 9 inches to 6 inches with 5 height settings in-between. For this adjustability, it’s perfect for different forms of shooting. With this versatility comes an advantage of lightweight which makes it possible for the gun to be firm and upright when mounted on the bipod. And the base that’s capped with rubber will enhance this stability so that it won’t slip on the ground. Still on those legs; they’re foldable and this makes for safe storage and mobility. The high tension springs will also allow the rings to quickly and easily retract and because it’s made to mount on a sling stud, it’s quite easy to set up, thus making shooting with a bipod an easy task. This rifle bipod review includes Primos PoleCat Tall Monopods because it’s unique in its own ways. It ranges from around 25-62 inches in height. This gives an added advantage of the preciseness of shots. Because of this same height and strength, it’s able to double also as a support especially if you’re unable to walk steadily because of the uneven terrain. You’ll then appreciate this rifle stand from Primos. It’s durable because of its high-end technology and it’s adjustable to the height that’s comfortable to fire an accurate shot without having to bend down unnecessarily. It has a posy-lock design that allows it to maintain the adjusted height. Its handgrip is very light so that you can enjoy the comfortable cushioning when firing your shots. The market is awash with rifle bipods promising to serve you, only to let you down when you need them most. You surely would want to buy a rifle bipod that will give you the actual values for your spending. This review will be instrumental in that regard.